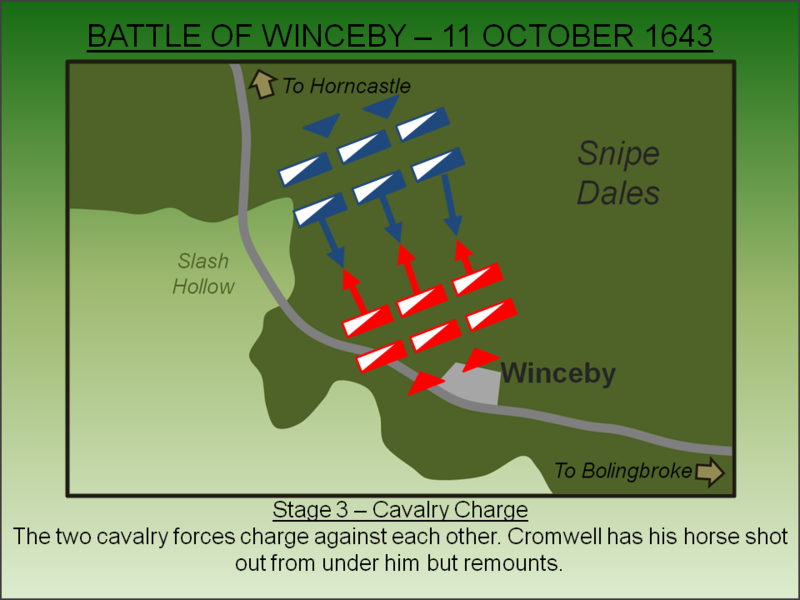 The Battle of Winceby was a relatively small engagement fought predominantly with mounted units. The Royalist forces, who were attempting to relieve a siege of nearby Bolingbroke Castle, were defeated in less than an hour in the first action in which Sir Thomas Fairfax and Oliver Cromwell fought together. By Summer 1643 Royalist forces in the north of England - under the command of William Cavendish, Earl (later Marquis) of Newcastle – had taken control of most of Yorkshire. Only the great port of Hull, under Royalist siege, was holding out for Parliament. However, this dominance was undermined by events in neighbouring Lincolnshire where Colonel Oliver Cromwell, with his army drawn from the Parliamentary stronghold of East Anglia, was moving on the key Royalist stronghold at Newark. As a precursor to this, he had captured Gainsborough in July 1643 severing direct communications between Newark and Cavendish. This was an unacceptable situation and, whilst he left a caretaker garrison at Hull to maintain the siege, the Earl deployed south with the bulk of his army defeating Cromwell at the Battle of Gainsborough on 28 July 1643. The force Cavendish had left at Hull proved to be insufficient for they were unable to prevent the evacuation of Sir Thomas Fairfax and the Yorkshire Parliamentary cavalry force. In total around 1,500 horse (27 troops each circa-60 strong), escaped into Lincolnshire and joined a re-organised Eastern Association under the command of Edward Montagu, Earl of Manchester. Now with a significant threat to his rear, Cavendish returned his Royalist army to Hull albeit leaving garrisons throughout Lincolnshire including a well provisioned 200 strong force at Bolingbroke Castle. 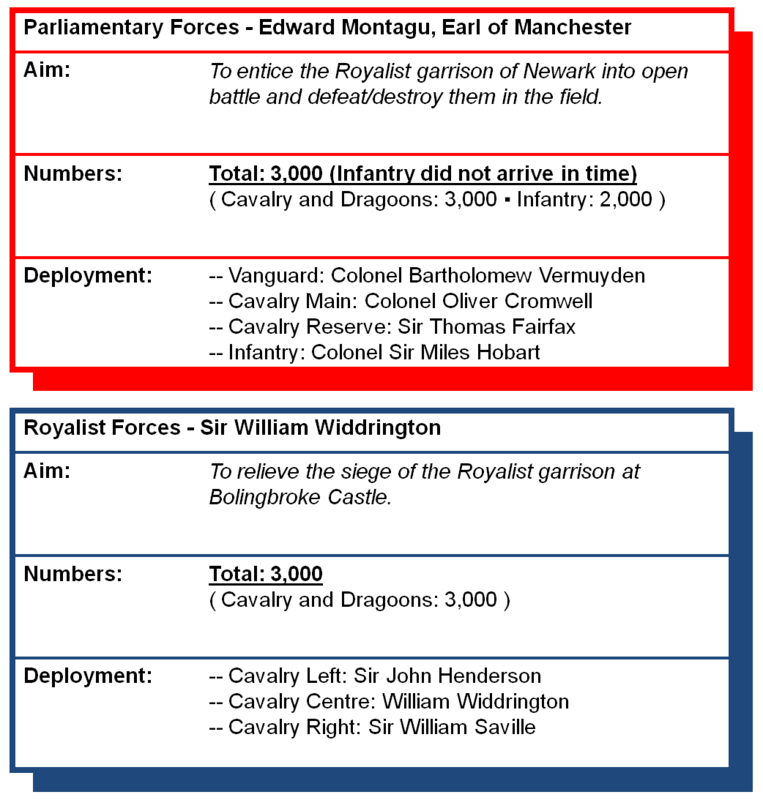 The Royalist force at Newark, some 30 miles west, was available to support if required. The garrison at Bolingbroke Castle dug earthworks to augment the outdated medieval defences and this proved timely because as the Cavendish withdrew, Montagu besieged the castle. Whilst Bolingbroke was a strategic site, it was situated on the main access north-west across the fenlands from the Parliamentary stronghold at Boston, Montagu’s primary aim was to draw the Royalist garrison out of Newark and into an open battle. The ruse worked for William Widdrington, Lieutenant General of Lincolnshire, and Sir John Henderson, Governor of Newark, took the bait and deployed a Royalist force to relieve Bolingbroke. The Royalist forces advanced via Horncastle taking the road that is now the A158. A small action was fought on the evening on 10 October 1643 with a detachment of Royalist cavalry defeating a scouting force consisting of a detachment from the Earl of Manchester’s own cavalry force. The following day the Royalists continued their march onto Bolingbroke taking the route of the B1195 via Winceby. 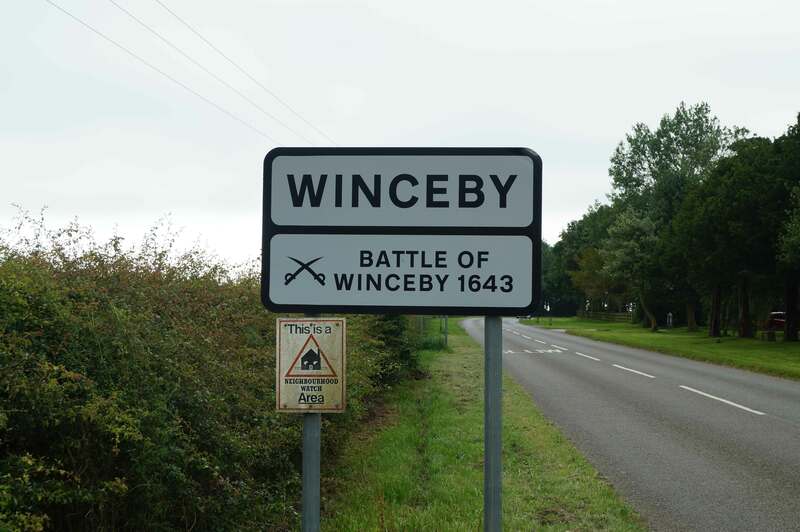 In terms of the Civil War, Winceby was a relatively small scale engagement with around 6,000 troops engaged overall. The battle was also fought almost exclusively by mounted units - cavalry and dragoons - as the infantry of each side wasn't brought up in time. 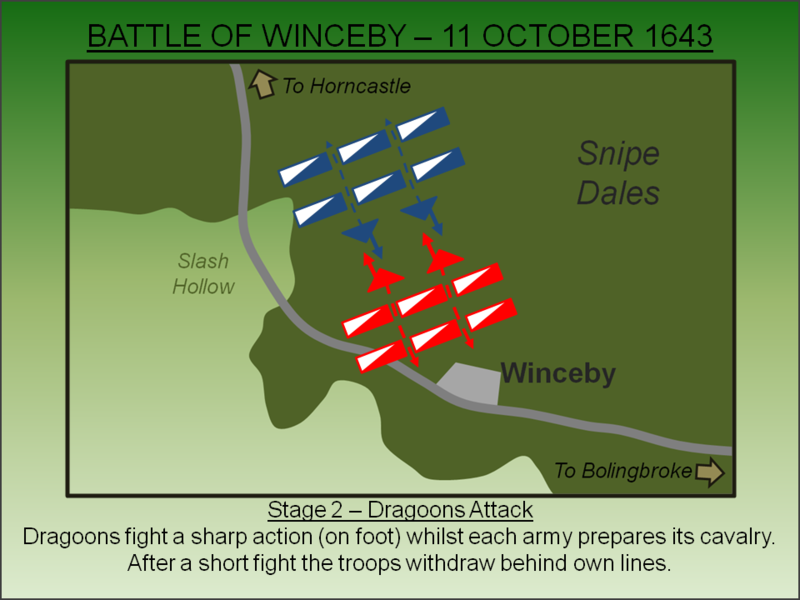 Having been alerted by the engagement the previous day, on the morning of 11 October, Montagu drew up his forces in battle array on Bolingbroke Hill barring the road from Horncastle. However, no Royalists were in sight and it was not until noon that he received intelligence they were still around three miles north-west albeit advancing towards him. Rather than wait for their approach, Montagu sent forward his entire cavalry force - under Cromwell along with Fairfax's Yorkshire Horse - supported by dragoons under Colonel Bartholomew Vermuyden. The Parliamentary infantry commenced an advance towards Winceby - Montagu was relying on them being a strategic reserve in the event the cavalry had difficulty. The Parliamentary cavalry intercepted the Royalists to the west of Winceby with the cavalry and dragoon elements of both forces drawing up in battle array on the summit of separate hills with a plain between them. The Parliamentarians formed up into six divisions with three in the first line under the command of Cromwell and a further three in reserve under Fairfax. The Royalists mirrored this line up with Saville commanding the centre and right wings whilst Henderson had the left wing. Further divisions were in reserve under Widdrington. The battle was commenced by a sharp dragoon action. These soldiers, effectively mounted infantry, deployed forward ahead of their lines allowing the cavalry elements time to form up in battle array. Almost certainly fighting dismounted, they subsequently withdrew to the rear of their lines. The two cavalry forces charged each other. In the fighting Cromwell had his horse shot from under him but managed to remount and narrowly evaded being killed in a counter-charge by Sir Ingram Hopton. On the Royalist left Henderson seems to have had some success with some accounts reporting the Parliamentary right wing, the cavalry of the Earl of Manchester (under Cromwell's command), being driven back. In the centre and Parliamentary left however, Cromwell had significant success breaking Saville's lines and sending them surging back into the reserve lines. With the Royalist ranks in disarray, at least in the centre and right of their lines, Fairfax now mounted his attack targeting his forces on the Royalist right. The Royalists, pushed back into their reserves across the length of their lines, broke and retreated in a rout. 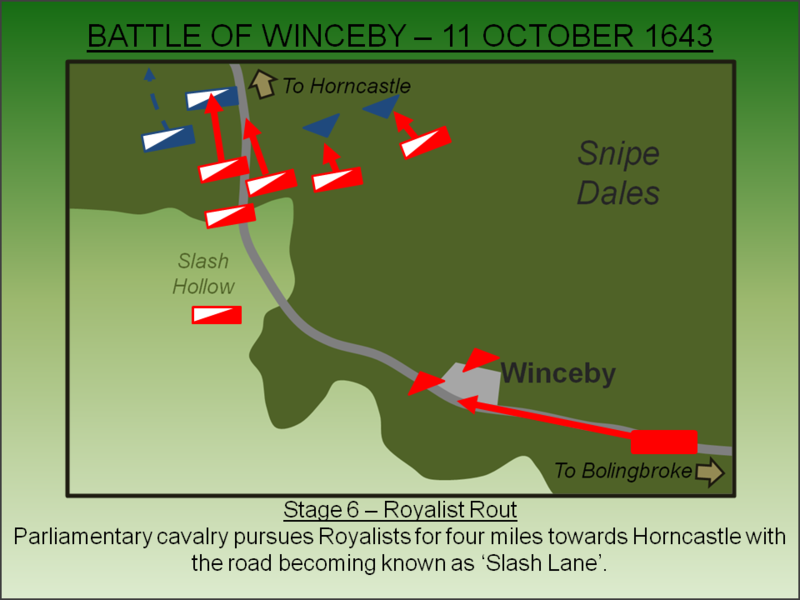 The Parliamentary cavalry pursued the Royalists remorselessly with the road to Horncastle earning its name of Slash Lane. In particular the Royalist dragoons, who had dismounted to fight the initial action, were abandoned by their cavalry and left to be slaughtered by the infantry forces now arriving from Bolingbroke. The battle lasted less than one hour and saw around 300 Royalists killed and a further 800 captured - around one-third of the original force - whilst Parliamentarian casualties were nominal. For his part in the failure at Winceby Sir John Henderson, Governor of Newark, was replaced by Robert Byron. More significantly the Royalist defeat also forced William Cavendish to call off his siege of Hull and bring his army south. But even so his force had been much depleted by the siege and Lincolnshire would remain a divided county until the collapse of the Royalist cause in the north at Marston Moor the following year. For the garrison at Bolingbroke Castle there was now no hope of relief and they surrendered on 14 November 1643. Lancaster, J.H.D (2014). 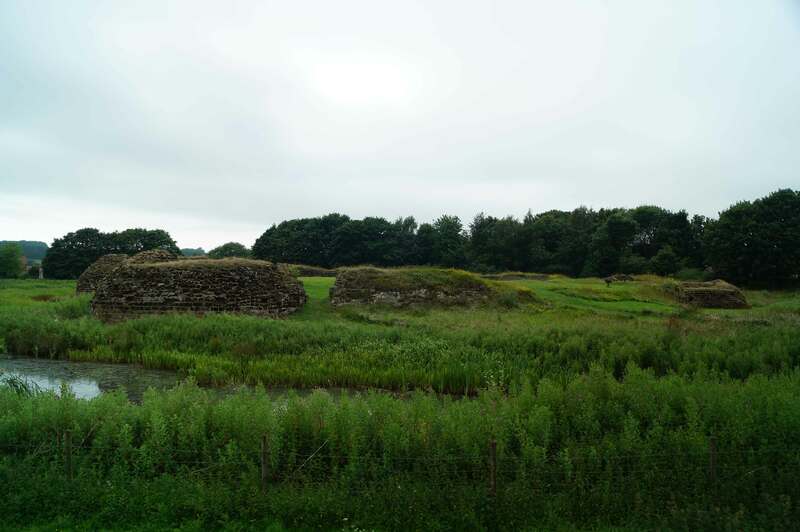 Winceby: Battlefield visit notes and observations. CastlesFortsBattles.co.uk. Ordnance Survey (2015). East Lindsey. 1:1250. Southampton. The battlefield has remained largely undeveloped and therefore the general terrain can still be appreciated. Slash Lane, now incorporated into the B1195, allows good access although care must be taken as it is not pedestrian friendly. 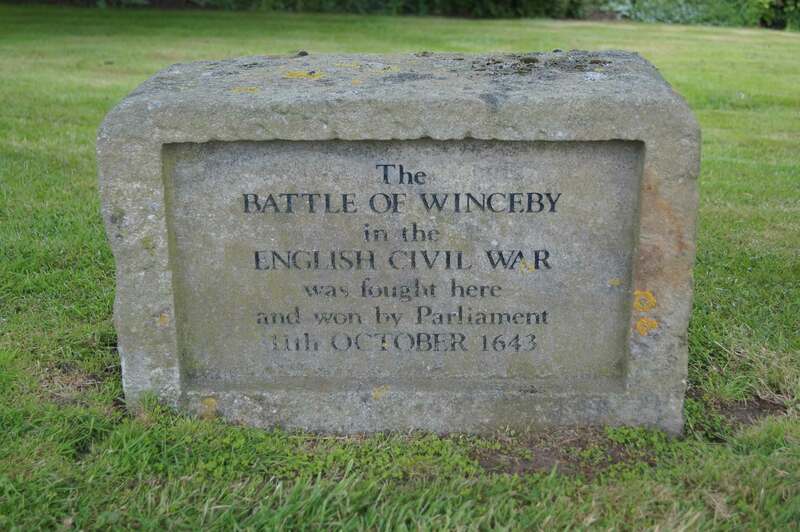 There is an information board at a lay-by near the Royalist position and the monument itself is found in Winceby (there is a car park in the immediate vicinity). There is also a very pleasant, circular walk from this car park that encompasses the eastern extremity of the (suspected) battlefield as well as the locations of several abandoned churches. Details at the car park. The Royalist position (viewed from their rear/right flank). Monument. The battlefield monument is relatively small and missed by many as they drive through the village. It can just be seen under the trees to the far right of the above photo. Slash Hollow. 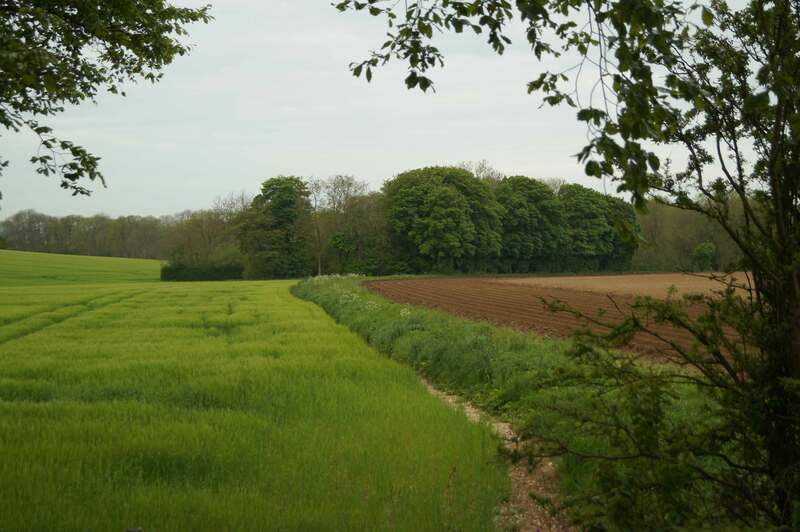 A public right of way runs near Slash Hollow - the scene of the rout of the Royalist troops. Bolingbroke Castle. The medieval castle, birthplace of Henry IV, stood on the road north from the Parliamentary stronghold/port at Boston and accordingly was occupied by Royalist troops before the Earl of Newcastle withdrew back to Hull. Today only the foundations remain as the structure was slighted on the orders of Parliament in 1652. After the defeat of the Royalists at Winceby, the garrison had no hope of relief and surrendered to the Parliamentary forces on 14 November 1643. (Click here for more on the castle). Winceby itself is well sign-posted and is accessed via the B1195 (Slash Lane). Parking is available at a dedicated lay-by and there is also a car park in Winceby itself.